I know I need to start making my way out of buying in the Junior's section, but this coat is exactly what I've been wanting - practical and warm, but still feminine and cute. I want to wear my hair like the model's! The sleeves are a bit long of course, but that's the only drawback. Love it! 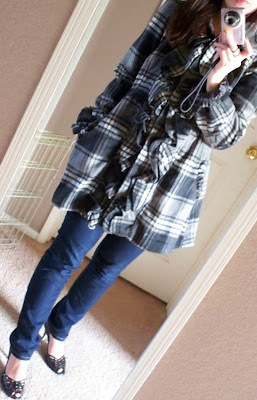 Love the plaid, especially since I don't own any in my closet. The length is nice too. I wish I could have gotten a picture of it from behind, because there is a cute bow near the waist. My Winter coat for 2011. Here is the swing coat I got from Forever 21. See? I think it works, right?! I would wear it with closed toe pumps but I was just trying this on for blog purposes. My hair back in a cute bun and I think it's darling for an evening out on the town. Ah!!!!! I love that coat!!!!!!! Well, BOTH OF THEM!!!! so so so so cute on you! The swing coat looks great on you! So cute! They are both perfect on you. I love the swing coat, such a cool look. So cute - the plaid and the ruffles are adorable. What great silhouettes! And please - as long as I can fit into the junior's section, I'll be buying clothes there. You cannot beat the prices! Dandy, Mere, and Andi: Thank you girls, I appreciate the sweet comments. 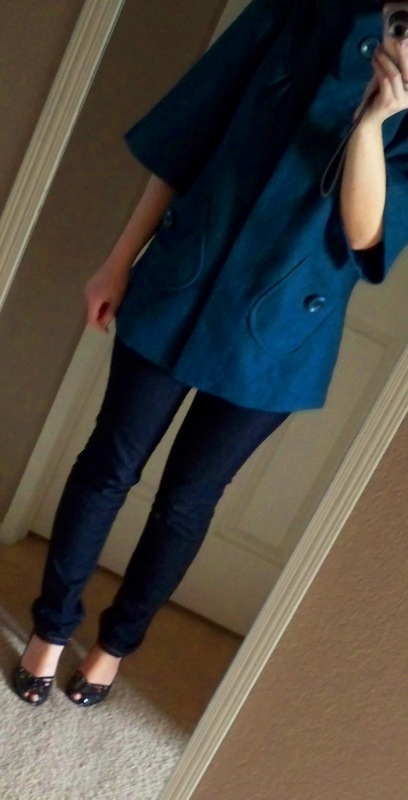 The swing coat is different than anything else I own, so I just decided to go for it! Kristen: Thank you! I agree, you can't beat the junior's pricing at Nordstrom. Those coats are lovely, my fav is the second one! that's so funny!! i just tried on that jolt coat yesterday, and loved it too!! i am frequently in the juniors dept too, so it figures. omg I LOVE that coat!!! And to answer your question on my blog. I have a Nordstrom card and I was sent an invite in the mail. I have been loving ruffle front coats!! Looks great! Amber: Thank you for answering my question! Jewelrybead: I looked at your blog already and really like it so I am following you! Cuteness missy! I think I need to go out and get a couple coats! Love both! What great finds!! Thank you girls, I hope you all are having a wonderful week! I love both of them! ...but what a great find from Nordstroms.